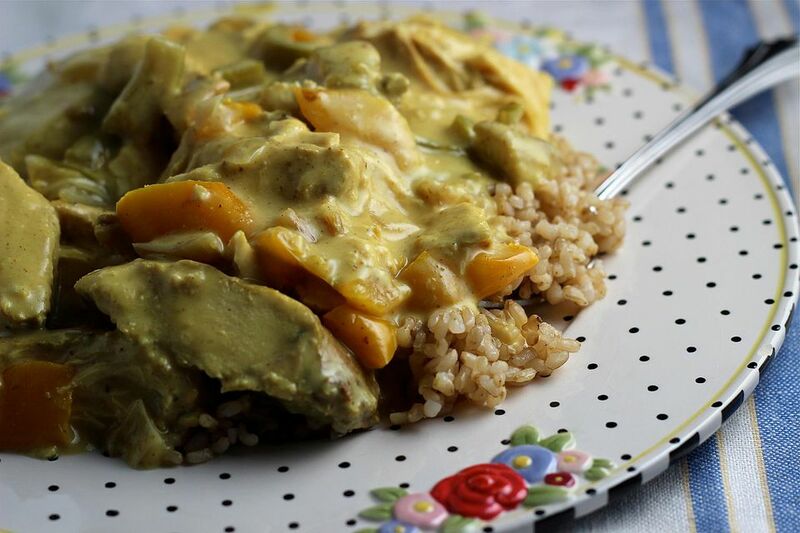 I adapted Orange Curried Chicken to cook in the crockpot. This delicious recipe, using orange juice, bell peppers, onion, and curry powder, is a fabulous dish for company. The combination of textures and flavors in this wonderful recipe is simply superb. The orange juice adds a sweet and tart note to the complex and spicy curry powder. The bell peppers are sweet, and the chicken becomes meltingly tender and almost velvety when cooked this way. The combination of the low heat of the crockpot, the orange juice, and the curry powder really tenderizes the chicken. I like to serve this recipe over hot cooked brown rice or wild rice. But you can also serve it over hot cooked pasta or even mashed potatoes or polenta. The recipe is versatile too. If you don't like bell peppers, use green beans or frozen baby peas (those should be added during the end of the cooking time so they don't overcook). Serve this dish with a nice green salad tossed with some mushrooms, and some brownies or a pecan pie for dessert. Spray a three-to-four-quart slow cooker with nonstick cooking spray. In the prepared crockpot, combine the onion, peppers, garlic, orange juice, water, salt, and curry powder and mix well. Top with the whole chicken breasts. Cover the slow cooker and cook on low for four hours. Remove the chicken from the crockpot with tongs and cut into strips. Cook covered on low for two to three hours longer until chicken is thoroughly cooked. In a small bowl, combine the whipping cream and cornstarch and blend well with wire whisk until no lumps remain. Stir this mixture into crockpot. Turn the heat to high and cook for 15 to 20 minutes, stirring once, until the sauce thickens. Serve immediately over hot cooked rice with chutney, more curry powder, and condiments. If you have a new, hotter cooking crockpot, cook on low for 5 to 6 hours. Check the chicken at four and a half hours to see if it is thoroughly cooked.